Give the Gift of NJ Lottery for the Holidays! 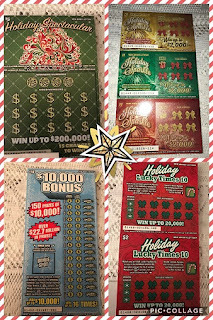 This holiday season NJ Lottery has four fun, holiday themed games that you can give to family friends this Holiday season. 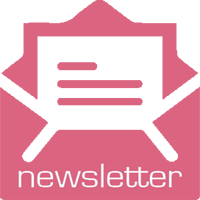 These Holiday games make for the perfect gift, stocking stuffer, party favor, etc. for anyone and everyone on your list over the age of 18. 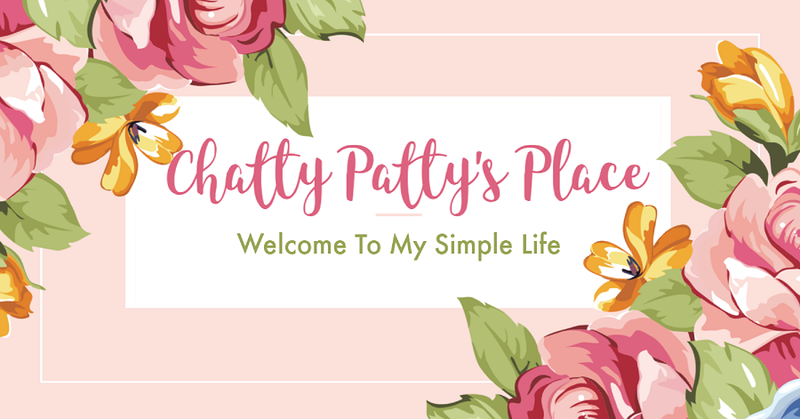 These tickets can be used to create fun, easy DIY projects to give as a decoration, gift, centerpiece, party favor, etc. NJ Lottery games include, Holiday Spectacular with prizes up to $200,000, $10,000 Bonus with a chance to win one of 150 prizes of $10,000! 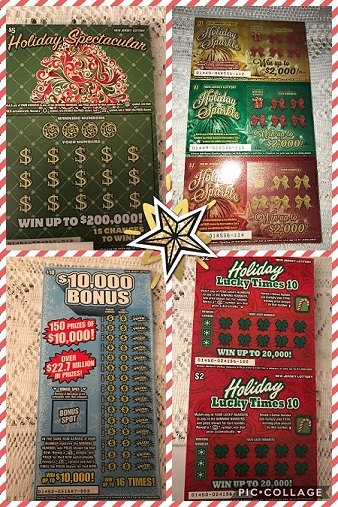 There is also Holiday Sparkles with prizes up to $2,000 and Holiday Lucky Times 10 with a chance to win 10x your prize! With so many chances to win I will be picking some up for myself as well! 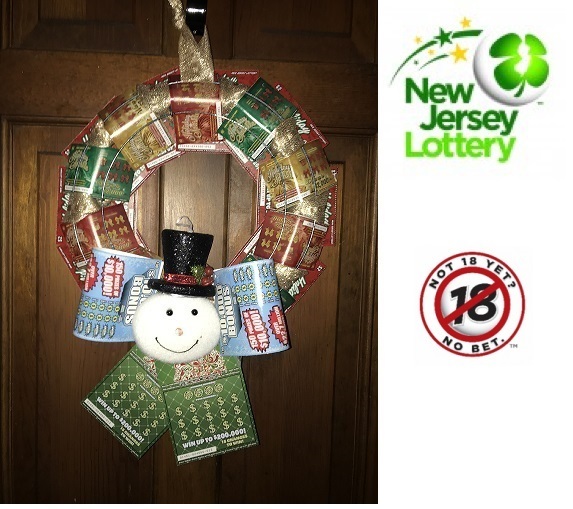 Imagine the joy on the face of your recipients when they receive a beautiful homemade NJ Lottery gift created by you, from NJ Lottery tickets. 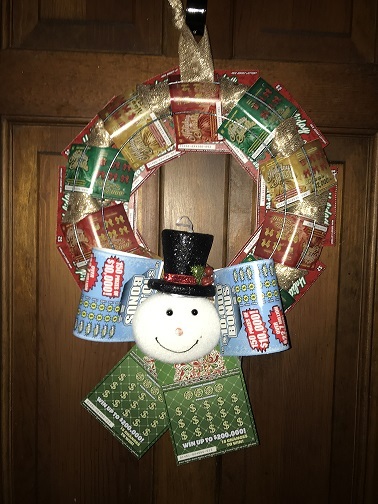 Look at this beautiful wreathe that I made using NJ Lottery tickets. 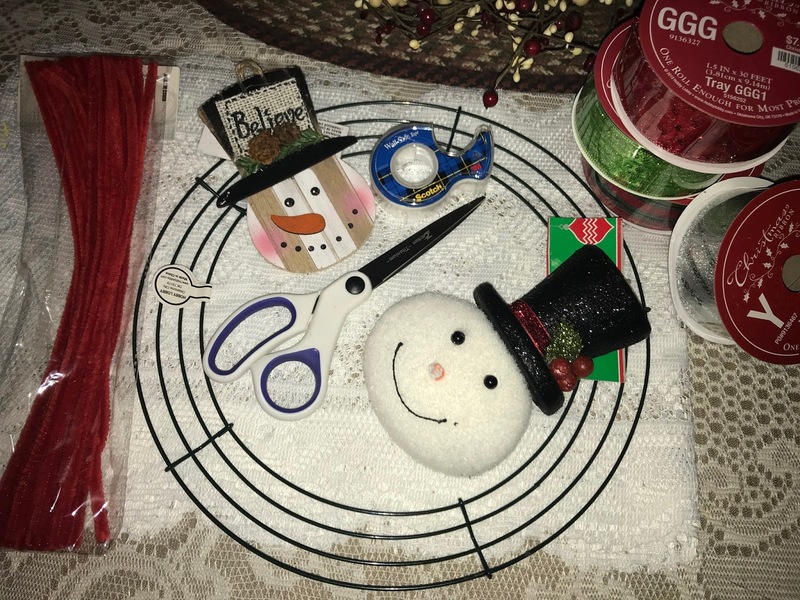 I used a wire wreath form that I got at my local craft store, tape, ribbon and a holiday decoration I got at the dollar store. It was so simple to make. I simply inserted the lottery tickets into the wire, wrapped the wreath with gold ribbon, adorned it with my little snowman using floral wire and made a large bow using larger lottery tickets and tape. It took me less than 30 minutes to complete and I think it makes a great gift! Don’t forget to pick up extra NJ Lottery Holiday tickets to use as stocking stuffers, office gifts and gifts for hosts and hostesses. While you are there, why not pick up a few for yourself? NJ Lottery tickets are available at any brick and mortar Lottery retailer, such as Quick Chek, Wawa, 7-11, etc. 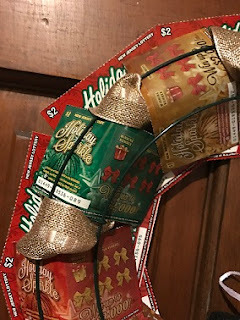 NJ Lottery Holiday Scratch Offs makes gift giving easy and stress free. I know I would be happy if I received a winning NJ Lottery Holiday Instant ticket. As a matter of fact, I would be jolly! 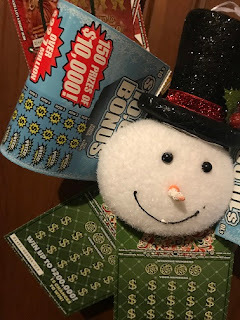 What would you do if you won with NJ Lottery Holiday Instant tickets? Don’t forget about the Million Dollar Replay (MDR) from NJ Lottery. Million Dollar Replay is the Lottery’s second chance drawing program which allows players to submit their non-winning instant tickets into a yearly drawing for $1,000,000! Disclaimer: You must be 18 or older to buy a lottery ticket. The New Jersey Lottery reminds players, it's only a game...remember to play responsibly. If you or someone you know has a gambling problem, call 1800-GAMBLER®. Disclosure: I received NJ Lottery Holiday Instant tickets to facilitate this post as well as compensation. What a fun idea! I always give NJ lottery tickets to my parents. This would be a fun way to give them as a gift.